My beautiful Paloma... she was my first horse and will always be so special to me. It feels so good to have her so close again... and as we waited, I realized that Paloma will be helping to raise little Mirabella. She will be her new horse mommy! So here she is, waiting for the little princess to arrive. We have a plan to keep them close but separate and to take things very slow (and safe). Paloma is a sweet mare and pretty passive too... I think this will work out nicely. ♥ So I now need to decide... do I start keep writing here on Willow's blog? Or should I start a new blog for Princess Mirabella? Paloma is beautiful! What a great horse mommy she will be <3 What will make you happier, Shana, to continue writing on Willow's blog or start a new Princess Mirabella blog? 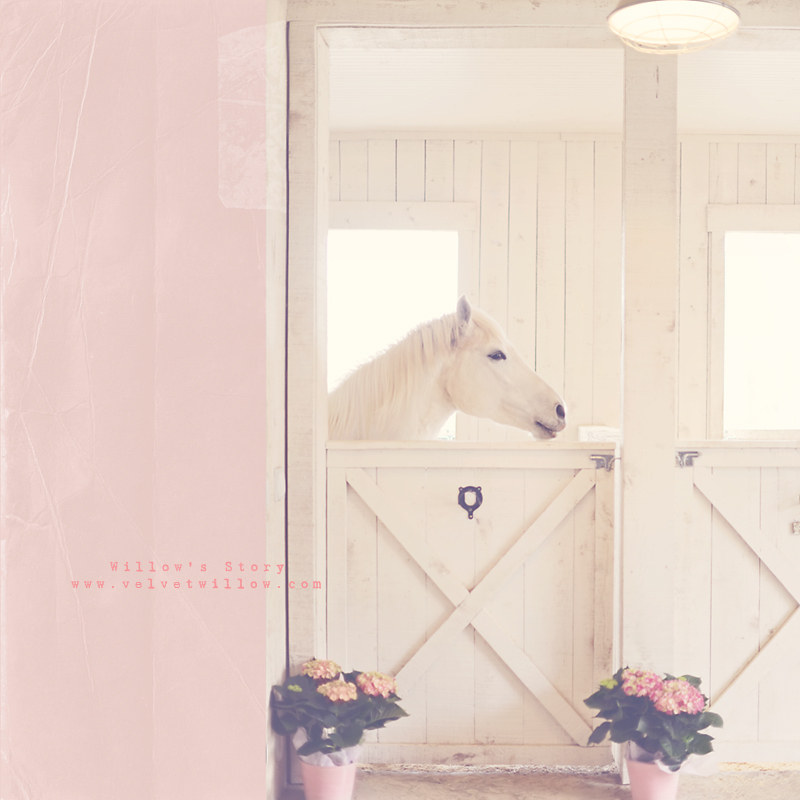 You could always start a new blog for your baby girl and still add snippets to Willow's :) I love the hydrangeas in your stable! Since Mira is a part of Willow's history, you should keep it on this blog. It is truly a continuation of Willow's story and her legacy that you cherish so deeply. I think Willow will want you to continue on here, or she may think she has been forgotten. Although I know you haven't and never will forget her! I like that Mira is here ... since she's really "a part" of Willow. I truly believe Willow's story lives on in Mira! Keep it on this blog please. Carry on the legacy of Velvet Willow. Whatever is right for you, but I like keeping Willow's legacy alive here. Congratulations on your new baby, and it's wonderful to see Paloma featured again. After everything that has happened and how you came across Mirabella, I think you should continue blogging here... What a wonderful gift! WIllow led you here to this new chapter but you have to be comfortable with it continuing on this page rather than a new one. Seems so natural after all the signs in the last few days to keep it here. I think you should continues Mirabella's story on here with Willow's since they seem to intertwined with each other and with you! That way they will always seem connected to each other here on this blog. Keep it here....it was meant to be. Dang tears again! Keep it here.... This story is a reminder of miracles and hope and faith...It's most definitely a page I visit often. Stay here...all connected and without Willow's life story, the current would not be part of this story...and so it continues. xo. just continue this blog .... it is nice for us to read and reread too .... please ? Willow - she was and is the inspiration for this whole journey. Whatever you do, I'll follow you, either here or at another blog. I must say I like it here, as it keeps Willows memory so much alive. I think you should keep it here as well - any newcomers will have the history all in one place. I think whatever you do.. I will still follow this story.. this new chapter... in your adventures... if you decide to start a separate blog.. please share the link. It is STILL, and always will be Willow's story .... without her ... it never would have been !I think it very fitting it stay here! I think we continue the story here. We are Willow's extended family and the story continues. Willow will forever be in our hearts, but now we open them to a new love. I will follow the story whichever you decide. I think you should keep the story here....I will follow it no matter what, but the whole story started with Willow, she was the beginning and what led you on the journey to begin with. I feel this is just a continuation, the next chapter, but the same story. Keep writing here. It will be an honor to Willow. Plus, it's how we all found you. I too hope you will keep it here. So happy for you and your family. I love your Beautiful stables!!! Beautiful horses! I would honestly keep this blog, in memory of Willow and also as you have her cousin, it seems fitting!